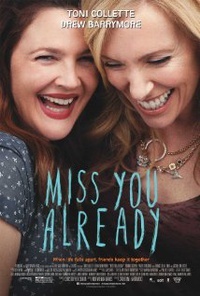 Miss You Already is a 2015 British romantic comedy-drama film directed by Catherine Hardwicke and written by Morwenna Banks. The film stars Toni Collette, Drew Barrymore, Dominic Cooper, Paddy Considine, Tyson Ritter, Frances de la Tour, and Jacqueline Bisset. It was screened in the Gala Presentations section of the 2015 Toronto International Film Festival. The film opened theatrically in the United Kingdom on 25 September 2015 and in the United States on 6 November 2015 to mixed to positive critical reviews. This webpage uses material from the Wikipedia article "Miss_You_Already" and is licensed under the GNU Free Documentation License. Reality TV World is not responsible for any errors or omissions the Wikipedia article may contain.